My first HALO prose appears in September's HALO: FRACTURES! I had announced earlier this spring that my first Halo comics story would be in the new Halo: Tales from Slipspace hardcover coming from Dark Horse on October 12, 2016. Just as I did both Star Wars comics and prose, I can now announce I've done the same for Halo. 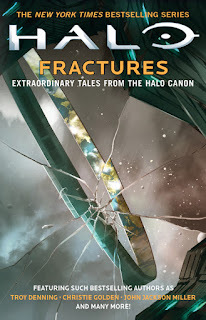 My first Halo prose appears in Halo: Fractures, a short story anthology releasing September 20 from Simon & Schuster. Halo Waypoint has the complete list of authors here, but you will find me among Star Wars and Star Trek alums Troy Denning, Christie Golden, and James Swallow, as well as Matt Forbeck and a lot of other fine folks. It appears to be a trade paperback collection. I expect to have preorder links available for Halo: Waypoint shortly.